A group of aspiring educators from Indiana State recently learned that they will school veteran teachers and professors about technology at a conference in California in March. Students and a professor from the technology and engineering education program at ISU will present "Using Our Technology and Your Technology Classroom" at the International Technology and Engineering Education Association conference in Long Beach, Calif. The group will discuss recently created inexpensive technology that can be used to help teach students, said Kara Harris, assistant professor of applied engineering and technology management. Six students from the technology education program are expected to be part of the group giving the conference presentation. "Public school teachers sometimes don't have time to learn the latest technologies that they can use in the classroom that are affordable," Harris added, "and the students are going to be taking those types of technologies that teachers can use in the technology and engineering classroom that are free or very cheap, and demonstrate how they can be used, how effective they are" and other benefits. The ISU students will inform educators how smart phones and tablet devices, such as iPads, can be utilized in the classroom, said Dan Lewellen, senior technology education major from Clayton, Ind. He advocates for educators to utilize technology more frequently, especially given that such devices are more prevalent than ever before. "You can get instant access to any kind of reference with tablets and smart phones," Lewellen said, "and it seems like a growing trend that kids have smart phones and sometimes can outperform teachers with using technology." They proposed their idea for the conference to event organizers in June, and earlier this semester learned that they had been accepted in a refereed process for the conference. Students are rarely given the opportunity to contribute presentations at the conference, Harris said, which makes their accomplishment even more impressive. "These are students doing this, when professors are oftentimes turned down" for their presentation ideas, Harris said. The ISU students became interested in wanting to teach others about different ways to present material to students, said Lewellen, who added that the group was interested in the challenge of giving a presentation at the international conference. A group of technology education students have attended previous conferences, which have included competitive events where the students represent ISU. Yet this is the first time that Lewellen can remember students will actually give a presentation at the conference. "Of course, we are excited to represent ISU at a national conference this year held in Long Beach," Lewellen said. "This will be the most elaborate conference that this group has been a part of." 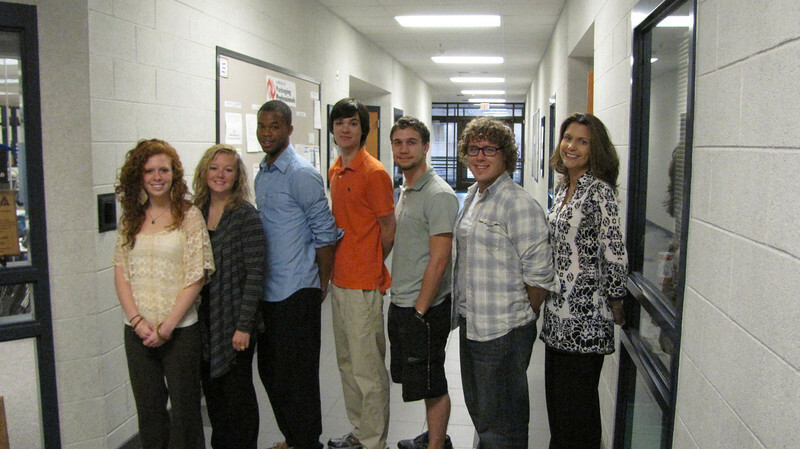 Indiana State University students Molly Joseph, Megan Jackson, Derrick Robinson, Daniel Lewellen, Paul Bennett and Cody Eaves and professor Kara Harris will present "Using Our Technology and Your Technology Classroom" at the International Technology and Engineering Education Association conference in Long Beach, Calif., in March. Contact: Kara Harris, technology and engineering education program coordinator and director of undergraduate academic student services, 812-237-9633 or kara.harris@indstate.edu. Students and a professor from the technology and engineering education program at ISU will present "Using Our Technology and Your Technology Classroom" at the International Technology and Engineering Education Association conference in Long Beach, Calif.